2015 has been a year of challenges in politics, economics and societies everywhere. Sometimes it seems the world is going crazy and people have stopped thinking. I believe what´s coming next is still in the dark. I usually receive messages of people without any idea of what´s going on in Finland. People from many countries really believe this is a land of rich people with no problems and opportunities rising everyday. So, if you are one of those, this article is for you. I am not going to analyse the crisis on this article, I have done it a couple of posts before. You can read it here. Opinion article. This was a year of fallen masks which has shown that even a highly educated population can be manipulated by populist promises, that even here many people vote without actually thinking and researching about their candidates proposals, and that not even one of the best educational systems in the world is able to give sight to the blind. But there´s something good in all this; not the blind, but those who were only asleep or taking a relax with their eyes closed realised it´s time to wake up, pay attention and see that everything is changing so fast that future looks scary. A new Government coalition was officially named on May 29, formed by three parties from the centre and right wing, which gained the most seats in the elections: the conservative Center Party, the populist “True Finns”, and the moderate conservative National Coalition Party. I´ve been very sceptical about this coalition. Although one of the parties is the center, its representative and our Prime-Minister is a rich former CEO, not a very experienced politician. Ruling a country like Finland as if it were a company sounds really bad to my ears but it´s a fact that among the “three favorites” he was the best option for the role. I was also afraid he would become too close to our former Prime-Minister (Stubb) and start a very strong alliance with his party, the National Coalition, but I am glad it didn´t happen. At least not until this moment. I see this coalition without much balance, carrying much of the weight in the same side of the scale. And in my humble opinion, this is very dangerous. Epiphany and Ascension Day would be changed into unpaid public holidays without reducing annual working time. The benefit level for sick days would be reduced so that the first day will be unpaid and only 80 per cent of pay would be paid from days 2–9. Overtime pay would be halved and Sunday pay would be reduced to 75 per cent. Long holidays, particularly in the public sector, would be shortened from 38 to 30 working days. The private employer’s social security contribution would be reduced by 1.72 percentage points from the beginning of 2017. Being really honest, if this is really time for sacrifices, if the situation is so bad to the point that radical measures have to be taken, I would not complain as long as the changes come as equal sacrifices to everybody. But you don´t need to be an expert to see that some of these measures would affect more drastically only one segment of the population: those with lower-income. Think: who are the professionals who work on Sundays, at night and during holidays? You might think of a couple of professions with good income which would be affected but wich ones are the majority? These measures could work but they are so unfair that a national reaction was immediately brought up. 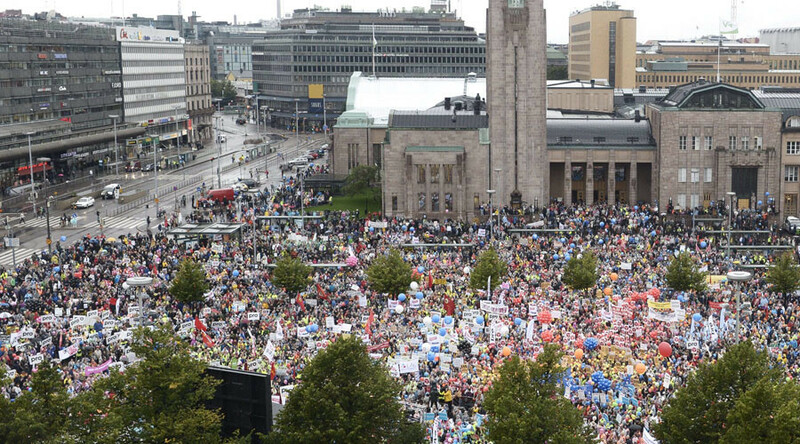 A week after this announcement 30 thousand people went to the streets of Helsinki to protest against the Government cuts. The strike affected the entire country since public transportation and schools also stopped. You can read about it here and here. And those were not the only proposals which have revolted the citizens. One of the biggest reasons of pride for the Finns is their educational system, among the best of the world. When the subject is high education, Finns are very proud to state that here every citizen has the opportunity of choosing a path in life, since even Universities programs are free of charge. High education institutes have invested a lot promoting internationalization of the education, since the country needs experts and it´s been proved we don´t have enough people here to make the necessary demands. Specially if we´re talking about Science, Technology and Innovation. About this matter I confess my opinion is divided. It will be for sure bad for the internationalization of the institutions in bachelor levels (master and doctorate students will still studying for free) but the prices discussed are not outrageous – around 1500€ per year – and if the situation is so bad to the point institutions cannot afford improvement, there´s no other way to go. Read more about it here. More changes? Yes, there are more but I don´t disagree on all of them. As I mentioned at the beginning, it´s time for sacrifices and some unpleasant measures will be taken. However, I think the Government is taking away from the wrong places. After all protests some things have changed and, of course, the Government had to back off. On September 29 the newspaper Helsinki Times published the Government response to the protests. You can read it here. Another big episode happened at the beginning of November, when Prime-Minister Sipilä and Finance Minister Stubb disagreed on the destiny given to health-care policies. They were discussing for three days on how centralized the health-care system should be. In the heat of the emotions there was even a threat of ending with the coalition; a disagreement that showed the situation is so complicated that the Ministers don´t even follow the same line of thought. You can read about it here and here. And there have been disagreements even inside the same party. The populist party “True Finns” has had internal disagreements and members highly opposing the fact that their leader, Timo Soini, Minister of Foreign Affairs, to support the coalition has contradicted some of his pre-election promises. Joke GIF made of Timo Soini, Minister of Foreign Affairs, regarding his “mind changing”. I sometimes watch the parliament meetings on TV and recently it gives me the impression that it´s been walking on a path of disagreement and internal disappointments. And I also confess that everything seems quite confusing at the moment, at least for me. Sorry for my ignorance or perhaps language barrier. Reality was very different from his statement, though. Finland´s bigger newspaper Helsingin Sanomat found that out of the 21 officials asked about the issue, 10 opposed it, nine refused to take a stand and two supported it – which leaves the actual support percentage at less than 10 percent. Read more here. One thing is fact: the following years will bring big changes. It´s too early to predict but I am really curious to see what the government will carry out. I expect to see changes in areas which are extremely bureaucratic and are not working anymore with the necessary effectiveness, such as the social care system. And of course, I just hope these changes won´t generate a social exclusion nonexistent before. I hope the government has good eyes to see that marginal social classes are arising due to increasing of poverty, lack of job opportunities and lack of effective policies of social integration.